My husband gave me hiking poles a few years ago, soon after we moved into hiking country. I have always loved hiking. In fact, it may be my favorite way to spend my free time...other than cooking, of course! Climbing up hill has been the easy part for me, coming down would often take me longer than going up....the reverse of what it is supposed to be. I have this thing about falling...hate it, actually. So I take smaller and smaller steps which makes me a lot slower. Hence the reason why my husband bought me walking sticks. I resisted using them for a while...they made me fell like I was getting old. And honestly, I often just didn't remember them. Slowly but surely I have gotten better and better at remembering and using them. It is amazing the difference they have made in my speed coming down. I have so much more confidence because of the stability they give me. Being in better shape has also helped me. Taking a hike recently with a friend who was also using hiking poles she mentioned to me that her doctor had told her that the poles take 30% of the pressure off your knees. For those, like her, with knee issues, this is great news. We also started talking about how using poles is actually more aerobic since your arms and legs are working in tandem. This made me think it would be interesting to find out all the benefits of hiking poles. Turns out there are many! There are many different kinds of hiking sticks and/or poles depending on how you plan on using them and your preferences. I found a great link on REI that explains the various options and types (rei.com). They also provide videos on how best to use your poles. 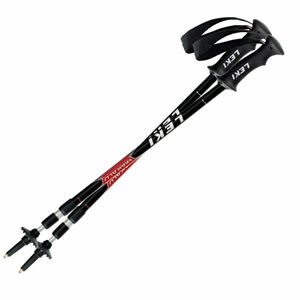 The poles I use are Black Diamond. They may be a few years old but they remain in great condition. So after doing a little research I have discovered that using walking poles is a great thing with many benefits. Maybe why I also thought they were for older people is that with age you gain wisdom...and use your knowledge to greater benefit!